JERUSALEM - Israeli Prime Minister Ehud Olmert endorsed an emerging Mideast cease-fire deal late Friday, after a day of dramatic day brinksmanship including a threat to expand the ground war in Lebanon. The agreement calls for the deployment of 30,000 Lebanese and U.N. troops along the Israel-Lebanon border. It falls short of some of Israel's demands, including a strong mandate for the U.N. forces to take on Hezbollah guerrillas. However, the draft is the best chance yet for peace after more than four weeks of war that has killed more than 800 people, destroyed Lebanon's infrastructure and inflamed tensions across the Middle East. Neither the Lebanese government nor Hezbollah has said publicly whether they would sign on to the deal, but it was widely assumed that they did not object to it. Plans to take the resolution to a vote were announced in New York shortly after U.S. Mideast envoy, Assistant Secretary of State David Welch, met for a second time Friday with Lebanese Prime Minister Fuad Saniora. Israeli officials said Israel would not halt fighting until Israel's Cabinet has approved the cease-fire deal in its weekly meeting Sunday. It was not immediately clear whether the military would expand its ground offensive in the time remaining, or would only hold existing positions. Only six hours passed from an initial decision by Olmert to broaden the ground offensive to his acceptance of the cease-fire deal. The zigzag reflected Israel's dilemma after a month of inconclusive fighting. Israel has been unable to defeat Hezbollah and was concerned about growing Israeli casualties, as well as international condemnation, if the war continued. However, Olmert also feared that accepting a deal that does not rein in the guerrillas could lead to another war down the road and hurt him politically. Olmert's initial order to send troops deeper into Hezbollah territory came even as U.N. Security Council negotiations reached the final stretch in New York. Several hours later, France and the United States reached agreement on a final draft, to be put to a vote later Friday. The draft would authorize the deployment of 15,000 U.N. peacekeepers in south Lebanon, along with 15,000 Lebanese troops, into the region "as Israel withdraws." The Security Council, repeatedly accused of taking too long to come up with a response to fighting, would leave out several key demands from both Israel and Lebanon in efforts to come up with a workable arrangement. Despite Lebanese objections, Israel will be allowed to continue defensive operations, and a dispute over the Chebaa Farms area along the Syria-Lebanon-Israel border will be left for later. Israel won't get its wish for an entirely new multinational force separate from the U.N. peacekeepers that have been stationed in south Lebanon since 1978. The ongoing fighting has killed more than 800 people - including at least 732 Lebanese and 122 Israelis. After nightfall, there were some signs of troop movement on the Israel-Lebanon border. Battle-ready soldiers carrying heavy backpacks marched near the border as tanks assembled nearby. In south Lebanon, there were no reports of increased troop activity. Israeli officials gave conflicting assessments on whether a wider campaign was under way. More than 10,000 Israeli troops are already fighting Hezbollah guerrillas in south Lebanon. In the new phase, Israeli forces would push toward Lebanon's Litani River, some 18 miles from the Israel-Lebanon border, attempting to capture more than twice as much territory as they hold now. Olmert has faced growing criticism at home for the army's inability to halt the rocket barrages; Hezbollah has fired more than 3,500 rockets in the monthlong war. Polls also indicated that his initially approval rating, high at the start of the war, was slipping. 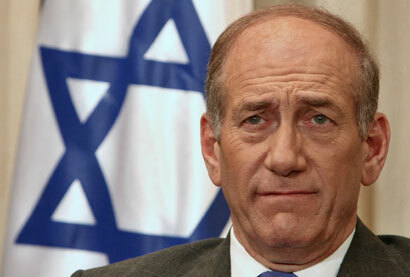 Commentators have suggested Olmert's political career was at stake, and that he might even be forced to step down. Many Israelis believe defeating Hezbollah is essential for their country's long-term security. In Lebanon, Israeli airstrikes pounded south Beirut and border crossings to Syria, killing at least 15 people as ground fighting picked up intensity in the south of the country. In the Bekaa Valley, an Israeli drone fired missiles into a convoy of refugees fleeing attacks in the southern town of Marjayoun, killing at least six people and wounding 16 others, an Associated Press photographer said. The Israeli military said it had no knowledge of the incident. The army noted that it had imposed a travel ban on south Lebanon, and had received no request to coordinate a convoy in that area. Throughout the day, civilians had been fleeing fighting in the Christian town of Marjayoun in long convoys after Israeli forces entered earlier this week. Lutfallah Daher, the photographer, was with the convoy when it was hit near the town of Chtaura, about 30 miles north of the Litani River. Israel had warned it would attack any vehicle on roads south of the Litani, assuming it was carrying Hezbollah weapons or fighters. Daher said the convoy consisted of more than 600 civilian vehicles and others carrying a detachment of 350 Lebanese soldiers and police when it left the area around Marjayoun. He said very few of the vehicles had left the convoy when it was hit.